Canada's Eldorado Gold has bought the mining rights to recoverable reserves of an estimated 12 million ounces of gold in northern Greece, worth over $14bn even at today's depressed gold prices. Three quarters of this is in the region of Halkidiki, the three-pronged peninsula that is also home to rich forests, white sandy beaches and hotel resorts. Here local resistance has plagued efforts by Eldorado's predecessor, TVX Gold, which eventually went bankrupt, partly as a result of losses and dashed investor expectations in the region. Eldorado has so far done better. It has won the local municipal council over, successfully applied for environmental permits and so far kept its investment on track. Eldorado plans to extract and process gold ore three years from now. There's many a slip 'twixt cup and lip, however. The prospect of turfing out and processing hundreds of millions of tonnes of ore is still a frightening one to many concerned for the environment, and those who disagree with the project have political backers. The Al Jazeera report is here. This editorial was published on EnetEnglish. The Democratic Left party made its withdrawal from the coalition official on Friday, when it removed its four cabinet members. At least three of these have been controversial for their internal opposition to austerity or their ideological differences from the rest of the cabinet. Antonis Manitakis, as minister of administrative reform, famously refused to fire a single civil servant while in office, despite the fact that Greece has pledged to ridding itself of 150,000 people from the overmanned public sector until 2016. Justice minister Antonis Roupakiotis was one of the more benign presences in an otherwise authoritarian and conservative cabinet. He advocated an anti-racism law the ruling New Democracy conservatives chose to bury. Partly thanks to his criticism, a new citizenship bill that would have made it harder for non-Greeks and their children to become enfranchised, or for Greeks to attend foreign schools, was never tabled in parliament. Deputy Health Minister Foteini Skopouli was a divisive figure, roundly criticised by the opposition radical left Syriza for failing to channel funds to hospitals and pharmaceutical suppliers. Her moment of highest controversy came earlier this year, when she allowed the Greek Centres for Disease Control and Prevention to run out of funds with which to carry out vital monitoring of HIV patients. Many observers opine that the work of reform and austerity measures will now move apace with the most change-resistant member of the coalition gone. But the government is left with a majority of just three votes in the 300-seat parliament - the type of margin that has historically ended terms of office prematurely. It happened to Konstantine Mitsotakis in 1993, and to George Papandreou in 2011. Now, however, the risks are greater. In 2011, Papandreou reluctantly invited the conservatives to join him at a time when Samaras was still touting the anti-austerity position. Samaras came kicking and screaming, but together they controlled two thirds of parliament under a consensus prime minister. Now, they barely produce an outright majority, and there are no other parties supporting the memoranda of measures that accompany Greece's bailout loans. 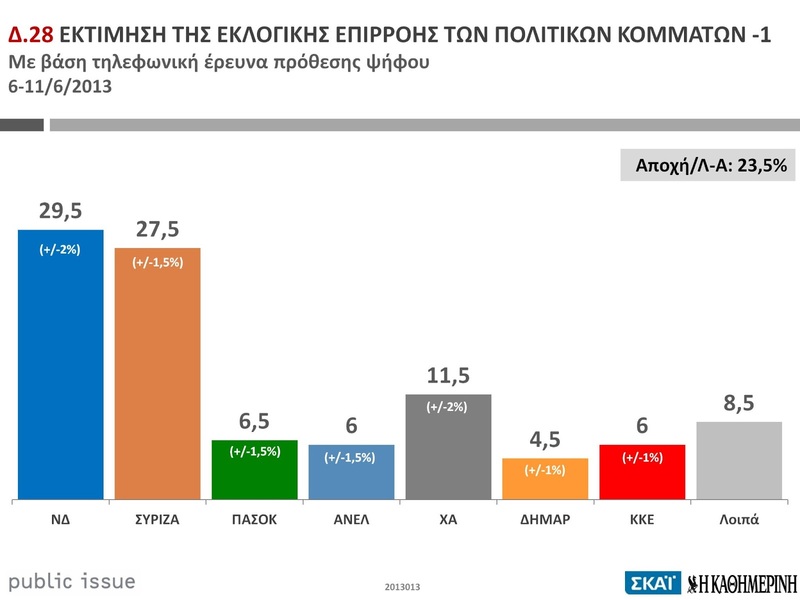 It is almost as though a consensus is forming in Greek public opinion that the bailout plan won't ultimately be feasible and the country will be forced to declare bankruptcy - not because of ideological idees fixes or bone-headed opposition, but because the Greeks can no longer finance the recession through savings and work, and to allow themselves to drop into the abyss of their real standard of living is an indignity defying consideration. The problems aren’t just political perceptions at home. According to the Financial Times, the International Monetary Fund, a key lender, has openly stated that Greek debt is not sustainable. It threatens to stop paying Greece its portion of the bailout loan that’s keeping the country afloat, because its charter won't allow it to support a programme that doesn't add up. An abbreviated version of this article was published by Al Jazeera. Greek unemployment, now the worst in Europe, was posted at 26.8 percent for March. The jobless have been steadily increasing since May 2008, when the recession began. The situation is so bad, that two years ago the unemployed and inactive population together exceeded the number of people in work, which means that roughly one third of Greeks is supporting the other two thirds. In the midst of what may be the worst peacetime collapse of a developed economy, many Greeks have decided to go back to the land. The government has strongly supported this. Greece generated a mere 3.6 percent of its economy from the primary sector last year. Last February, Prime Minister Antonis Samaras launched a drive to reform and expand agriculture, announcing a 350 million euro fund to encourage agricultural entrepreneurship. “There can be no economic growth without emphasis on the primary sector,” Samaras told parliament. His government has been setting up clusters of farmers in greenhouse and livestock farming, and wants to do the same for fish farming, already a growth industry. The idea of returning to the land has legs. Some city folk didn’t wait for state support to go back to their country roots. For Damianos Zanaras it was a chance to return to his native Chios after a lifetime in shipping. He spent tens of millions of euros building a juice plant, financing the venture with his own savings as well as loans. 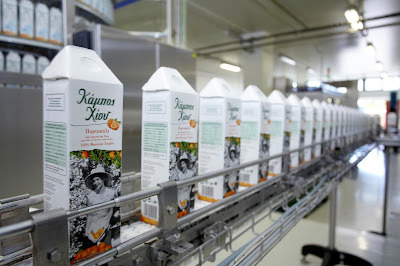 ‘Kambos Chiou’ would in theory build its success by making a Greek export of the distinctively flavoured local tangerine as a juice, improving the lot of farmers in the process. The trouble is not just that Kambos cannot replace the European Union’s once- generous subsidy system. It is also that Kambos is effectively having to replace the local farmers’ co-operative, which is defunct. Greek co-operatives were set up beginning in the 1960s to guarantee a minimum purchase price for produce, find markets for it and give farmers a collective ability to set market rates. Much of the difficulty in reviving Greek farming stems from the fact that in the 1980s those co-operatives were hijacked as a political infrastructure and never fulfilled their mission. “After Greece’s entry into the European Union and the arrival of socialism in Greece, these organisations… were transformed from organisations that served the farmer to organisations that served the party,” says Yannis Panagos, publisher of Agrenda, an agricultural newspaper. Put bluntly, the socialists used co-operatives to funnel money to the faithful and generate votes. European subsidies were a separate boon that coincided with the socialists’ rise to power in 1981. They roughly doubled what farmers made by selling their product. The combination of subsidies and party money created an environment in which co-operatives easily lost sight of their mission, and it led to uncompetitive farming practices. The evidence of what Tsaftaris describes is strongest on the Thessaly plain, Greece’s largest expanse of arable land. For decades it has pumped groundwater to increase yields in cash crops like cotton and maize. It now faces an environmental disaster, as water tables have receded by hundreds of metres. Unsurprisingly, Tsaftaris wants to help new farmers bypass the co-operative and subsidy system, and some of the most successful ones have done just that. Even on Chios, where tangerine groves are largely neglected, Vangelis Xydas and his brother have spun the successful Citrus brand out of their father’s tangerine grove. “We stopped seeing citrus products as fruit and started seeing them as a raw material,” he says. Citrus sells tangerine-flavoured preserves, desserts, pastas and baked goods through a small but growing chain of fully owned retail outlets. He is not the only one. Vasilis and Roula Balas perhaps suffered from rose-tinted vision when they quit their high-powered Athens jobs in IT and marketing to start a farm on their native Chios. “We wanted our family to grow up the way we had grown up, closer to nature,” says Balas. The original plan was to make a living from cultivating mastic, the aromatic sap of a tree that thrives nowhere else in the world and is used as flavouring or as stomach-settling medicine. When the Balases’ twins were born last year, they realised that they had to create added value by doubling up their farm as a tourist attraction, but ran up against local inflexibility. The fact remains, however, that innovators like Zanaras, Xydas and Balas are few. If the government is going to shift appreciable numbers of people into primary industry to help rebuild a broken economy, it will have to plan viable futures for them. See two related television stories on Al Jazeera. The first is about innovative farmers. The second is about the environmental disaster on the plain of Thessaly. 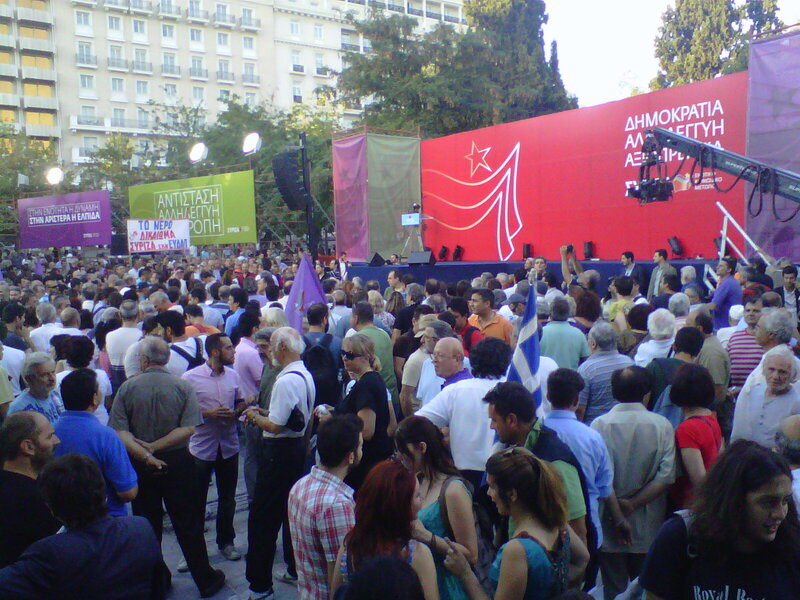 A Syriza rally gathers steam on Syntagma Square on Monday night. This was the first major political event not to be covered by Greek national television in decades, so Syriza installed an eight-camera crew and created its own production, which ERT streamed live. The event, complete with live music, camera cranes and slogans like "we are stopping the catastrophe, we are rebuilding Greece," had the feel of an election rally. Several political and legal trains were in motion in Athens on Monday night following the closure of the public broadcaster, ERT, last Tuesday, and all of their tracks will cross in the next 24 hours. A few collisions seem inevitable. Antonis Samaras, Greece's autocratic prime minister, was meeting his junior coalition partners beginning at 7:30pm, just as the leading opposition party, the radical left wing Syriza, held a rally on Syntagma Square in front of parliament. Samaras' job is to hold his coalition together after his partners disagreed with his closure of public television and have expressed broader concerns with his style of management. Syriza leader Alexis Tsipras' job is to give the impression that the coalition's days are numbered and the next election race has already begun. Several legal battles are also taking their course. The Council of State, the country's highest administrative court, will rule on Monday or Tuesday about whether Samaras' closure of ERT is legal. That would offer a legal answer to a political problem, one way or the other. In lower courts, a slew of media barons is engaged in a battle with unions over a series of rolling 24-hour strikes they declared last Wednesday, which are eating into revenues. Some newspapers and broadcasters have observed the strike, while others have not. The most serious of these developments by far is the meeting of the three coalition members. Upon its outcome rests the question of whether the government will continue to exist, or fall apart. The anger of the junior partners, who are centre-left, should not be underestimated. Socialist leader Evangelos Venizelos, speaking of conservative premier Samaras and his party, told Sunday newspaper Real, "New Democracy's plan [for ERT] was known to all the media... We knew Mr. Samaras' intention. He knew we completely disagreed. What would happen in any other European country with a coalition government? Would one partner proceed without a parliamentary majority?" Venizelos and Fotis Kouvelis, leader of the Democratic Left, the third and smallest of the coalition members, have complained in the past about Samaras' autocratic style of leadership. Tonight's meeting is likely to be about the broader rubric of their collaboration, not simply a patching up of differences over the handling of ERT. Venizelos and Kouvelis have not accepted Samaras' concession over the weekend to re-establish ERT's television signal with a small force of reporters, pending its broader restructuring. Hence the danger of an inconclusive meeting tonight, which would prolong the hiatus in the government's reform efforts. Rather than being a pilot for future overhauls of overmanned public bodies, ERT could represent a stalling of them.